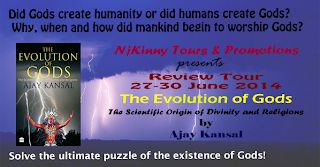 The Evolution of Gods seeks to answer these questions, and explains scientifically how, when and why religions and gods came into being. 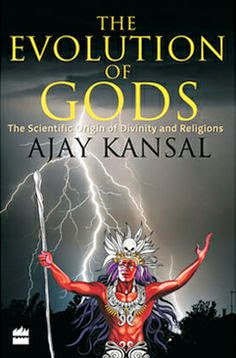 Ajay Kansal marshals anthropological and historical facts about the development of religions in a simple and straight forward manner to assert that it was mankind that created gods, and not the other way around. 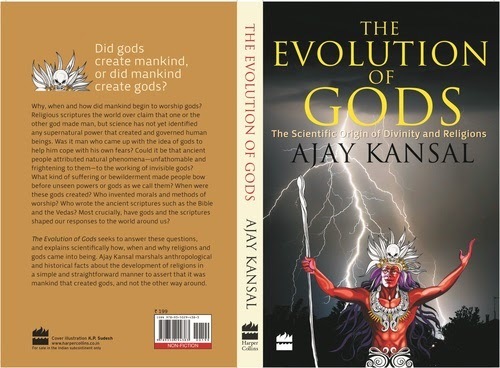 The Evolution of Gods: The Scientific Origin of Divinity And Religions is a book for atheists to sharpen their weapons and also a one for believers to enrich their faith in the Almighty. Dr Kansal, an ardent proponent of atheism who challenges the very existence of God and denies rationality of religions has brought out the best in me to consolidate my faith in Lord RAMA. Prior to this I never reflected back upon my religion with such a critical mindset, but the stir this book has created in my mind has led me to find scientific basis of my beliefs. The result is my faith now stands on concrete pillars which I guess wouldn’t be swayed by the strongest of the torpedoes. The author takes little more than 200 pages to deny thousands of years of wisdom and skillfully dismembers God to a mere fragment of Human imagination. The book written in a chronological fashion searches the history and existence of Gods through the scientific evolution of humans. It suggests that gods were created so that humans could explain the existence of things that were beyond their grasp like the lightning and rain, the day and night, the sun and the wind. Sometimes these uncontrollable powers were heralded as a boon and sometimes they were a bane. Hence they started to call them gods and prayers were started to appease them and to be on their good sides. At some point in time—we do not know exactly when this happened—people in various far-flung parts of the world developed an instinct. Whenever people encountered some power beyond their control that could harm or help them, they began to worship that power. The narrative skills of Dr kansal is quite strong, similar to his research. he keeps you spell bound and at every juncture he etches a clear picture of the facts with lucidity and argues his way that newer Gods were created to meet the newer challenges of mankind. history demonstrates that whenever humankind faced a new challenge, priests invented a more useful deity and consigned the older one to oblivion. The language of the book is very simple and the logic is quite undeniable. all can understand and relate to the perspectives of the author. The real beauty of the book is underlain in the fact that even though the author has argued the existence of God and given his explanations of the various myths he doesn’t try to burden the reader with his philosophy. This book is an effort to light a candle in the darkest corner of Human consciousness. The book contain 3 separate chapters on Hinduism, Judaism and Christianity explaining the way these religions came into being and how they developed throughout the history. These chapters are quite resourceful and informative about the different aspects of religion and beliefs. And I thoroughly enjoyed looking at different aspects of God as a whole. It is during these chapters author explains the existence of moral codes and various religious texts. Also during these chapters author has made a feeble attempt of comparing these religions and giving his opinion about their truth and existence. he tells how we have deviated from the original basics of these religion teachings. The core teaching of jesus said : ‘Love all do not kill even animals’. His last words for the people crucifying him read : ‘Father for they know not what the do’.Thus basic teaching of Jesus was non violence and forgiveness . ……….. Many of his followers fought countless wars just to establish their dominance. The author also describes how the presence of religions brought the scientific advancements to stagnancy. He launches an offence against the priests and their teachings, for the Dark Ages. the target audience is very skill fully chosen- the younger generation, the ones who are not extremists and is ready to have an open mind towards different points. The main aim of this book seems to be to achieve a state of religious harmony and respect, to avoid the conflicts on religious grounds and to train the next gen towards a better future. The ill practices still going on in the name of religion are well highlighted and depicted in an unbiased way. "The knowledge about the evolution of gods may vaccinate youths against the disease of religious extremism." The book is too ambitious, it’s written in a one track perspective i.e. for a given myth or practice he gives only a single explanation. Needlessly to say that this explanation is ruthlessly aimed to prove his point. his opinions inadvertently changes to judgments and I believe that a few might hurt the sentiments of a not so atheist reader. These kind of comments on one’s religion and belief are just undeniably over the top, Yajna is one of the most auspicious thing in Hinduism and the author just refers to it as a bane of the society. Though mostly the author has been cynical about Hinduism he doesn’t spare the other religions when he writes..
Is He willing to prevent evil, but is not able to? Then He is impotent. Is He able to prevent evil, but is not willing to? Then He is malevolent. Is he both able to and willing? Then where did the evil come from? Is he neither able nor willing? Then why call him God. These words of Epicurus were the starting words of his teachings that pleasure and pain are the measures of what is good and evil; death is the end of both body and soul and should therefore not be feared; the gods neither reward nor punish humans; the universe is infinite and eternal; and events in the world are ultimately based on the motions and interactions of atoms moving in empty space. These Were presented in a completely different way which I think is too ambitious. The author went a bit tad too far too prove his point, bending the teachings of a well known scholar. Lastly I would point out that though the book was supposed to be ‘The Scientific Origin of Divinity and Religions’ but the Scientific aspect of religion was completely overlooked. I have limited knowledge of other religion so I would like to keep my point in Hinduism. The Vishnu Puran explains Dashavtar First Matsya(Fish), Kurma the tortoise, Varaha the boar, Narasimha the half-man/half-beast, Vamana the dwarf, Parashurama, Rama, Krishna. If seen scientifically shows how Mankind evolved from fishes to amphibians to reptiles then mammals in mammals first beat then half beast (apes) then a dwarf after that Nomads (Parashurama), Ideal King (Rama) to a clever King (Krishna). There’s a long list of such examples which I don’t want to go in. Let me end my review by quoting Vipin Behari Goyal, ‘Nietzsche said, “Faith is a delusion, but then I never had faith in Nietzche”’ . 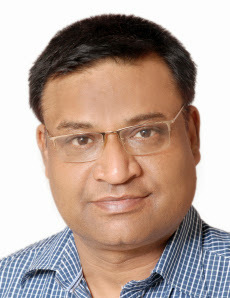 Dr Ajay Kansal is a professor and consultant pathologist. It was during his medical practice that he encountered human suffering in a big way that made him question the concept of Gods and drove him to write this book.